A deadbolt is standard equipment for most doors. They offer reasonably good security for the price, lasts for a long time, and require very little maintenance. The one drawback with locks,though, is that you need a key unlock them. If someone here loses a key, we have to get a new tumbler and update the keys for everybody. The NextBolt biometrically controlled lock is going to change all of that. It will not only increase security, it will make things more convenient for everyone. The way our front office door is configured, we need a key to both come in and go out. As we never leave it unlocked, anyone who wants to leave has to have their keys with them. No one remembers why it was set up that way, but we have gotten used to it and don’t think twice about this little quirk. The arrangement does have the benefit that no one ever locks themselves out as they have to have their keys in order to open the door to leave. The NX3 comes with the easy mount kit which allows mounting the lock with no drilling and comes pre-installed with the tailpiece assembly. The NX4 is the secure mount edition which adds two posts that add extra protection from prying while the NX5 adds a MUL-T Lok type key and all Grade 1 hardware (stike plate, cylinder etc..). As we wanted to do the installation ourself, the NX3 seem to be the best choice for us. The NextBolt NX3 Biometric Deadbolt requires a 2-1/8″ opening. Many newer doors have this larger opening, but older doors like ours have the smaller 1-1/2″ standard hole. 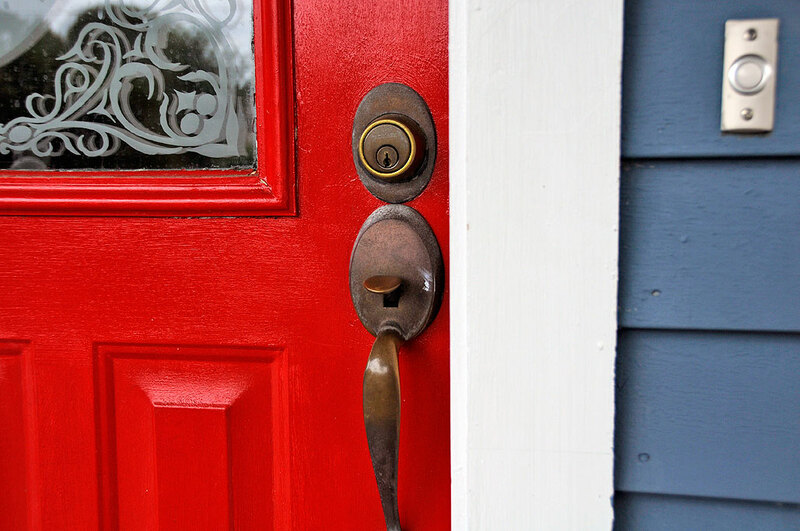 In order to install the lock, we would have to expand the current 1-1/2″ hole in our door to accommodate. The door is steel-coated and weather-proof. Cutting a new hole in it would require a blade which can cut through both wood and metal. The DeWALT Lock Installation Kit we looked at yesterday was designed for just such a job. It has a clamp which positions the cuts so they would be straight and the holes properly aligned. We used it for this project and the jig was worth every penny. We are certain we would not have been able to cut the bigger hole as cleanly as we had without it. If the door had had the bigger opening, this DIY project would have taken us about 10 minutes. With the hole now enlarged, installing the NextBolt was as easy as advertised. The mounting directions which came with the kit was very clear and we will not repeat them here. However, we will review the basic steps. The first step to the installation was to select the proper size bolt (2-3/4″ for us) and insert it into the door. 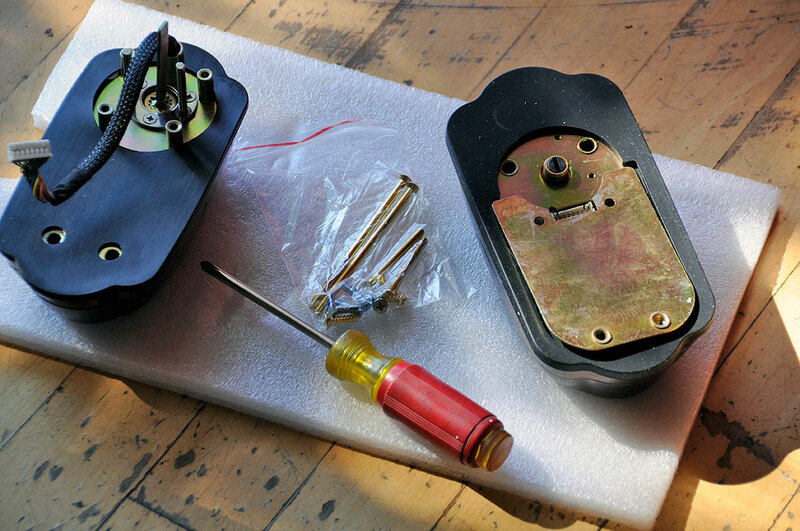 The next step was to mount the outside part of the lock to the plate on the inside. Once secured, all that was left was to connect the cable to the inside mechanism, insert the batteries, and screw things together. Amazingly simple. A few quick diagnostic tests confirmed that everything was working and the installation was finished. The last step was to program the lock for everyone who has to come in an out of the office. If not programmed with at least one fingerprint, the lock will open just by lifting the cover, so it is important to program it for at least one user. We had no problems with programming the first user into the system, but had quite a bit of trouble understanding the directions for adding the second user. It took us quite a few tries before we understood the programming sequence. We will clarify some of the directions and give you our impression of the NextBolt in our FirstUse report later in the month. 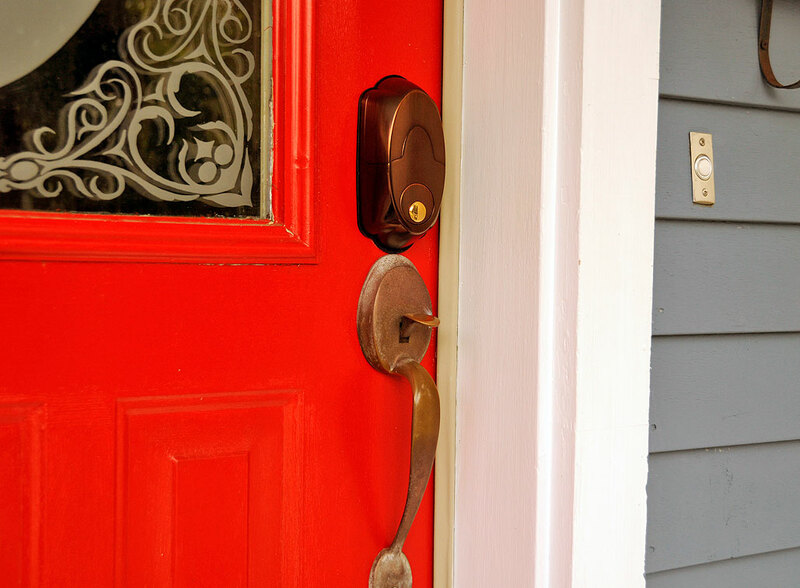 Deadbolts are the first line of defense against unwanted visitors. By eliminating the need for keys, the NextBolt is a nice security upgrade over the standard deadbolt. Of course, if someone really wants to break in and are not worried about announcing their intentions, a deadbolt will not offers much in the way of resistance. It is, of course, possible to thwart such an intrusion. However, the “how-to” to defend against that is another article for another day.